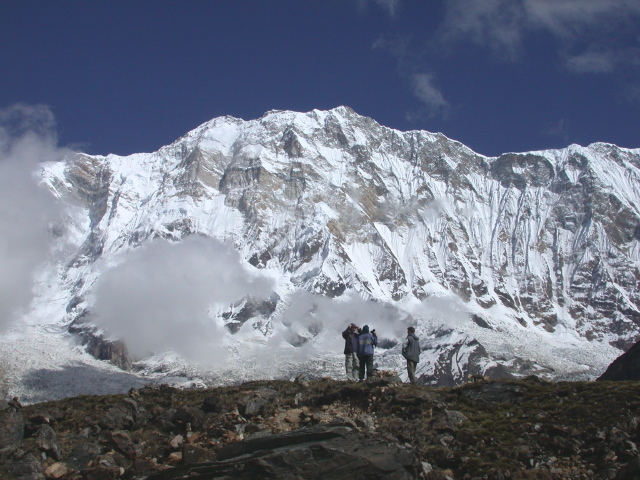 North face of the central Himalaya, where the rainshadow meets the snowline. Photo provided by Doug Burbank. 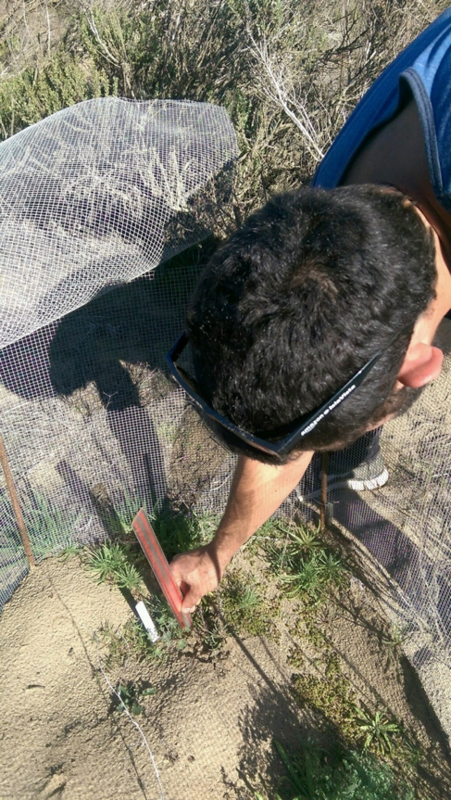 CCBER staff measuring Nipomo lupine seedling within experimental plot for USFWS grant. 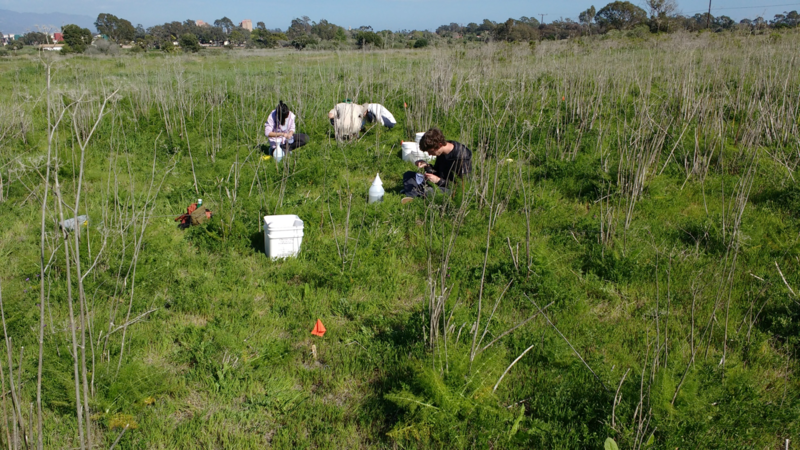 CCBER staff and volunteers collecting data on the endangered Nipomo Lupine Outplanting experiment at Black Lake Ecological Reserve for USFWS funded study. 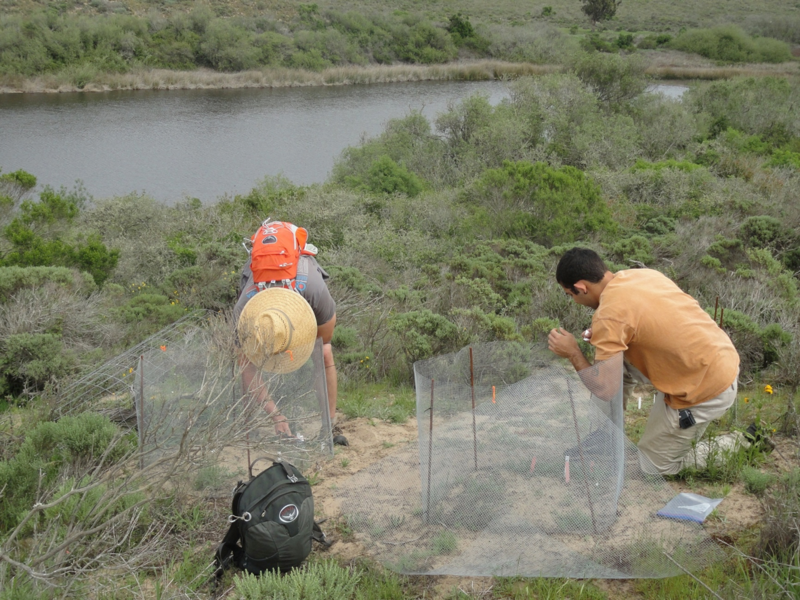 Student interns with Katja Seltmann, Director of CCBER and entomologist, performing a sweep net sampling of wetland habitats as part of the Associated Student Coastal Fund Arthropod study. 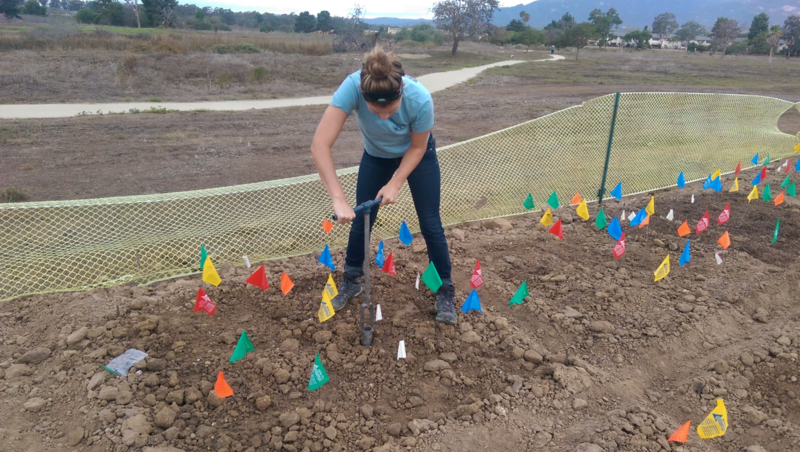 Cat Reilly taking a soil core sample for laboratory testing in the North Campus Open Space Experiment. 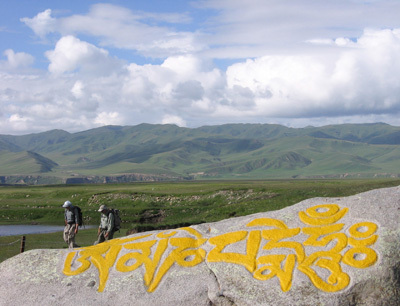 Professors Douglas Burbank (UCSB) and Eric Kirby (Pennsylvania State University) conduct fieldwork on the active Kunlun fault that cuts across Buddhist Tibet near the Yellow River. Strike-slip displacement on the Kunlun fault terminates near the northeastern margin of the Tibetan Plateau (see Kirby et al., Tectonics, 2007) in an area where the Yellow River is rapidly incising headward (see Harkins et al., JGR, 2007). 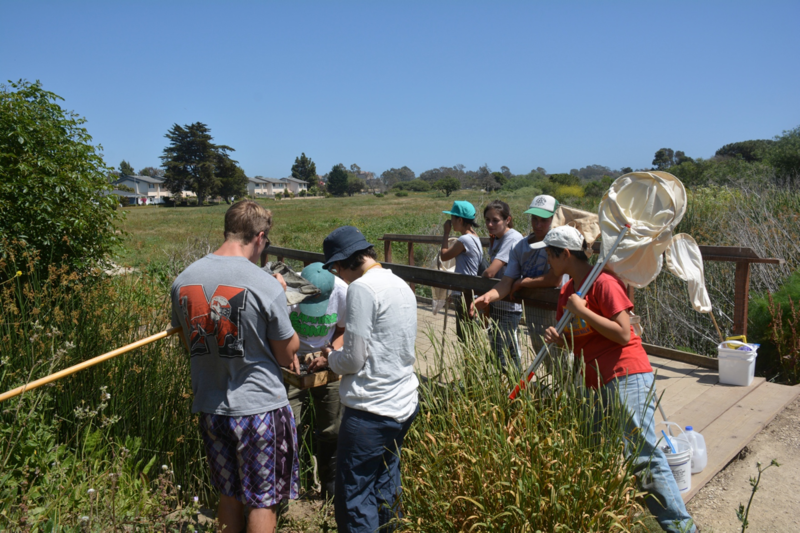 Student interns collecting arthropods from yellow pan traps as part of the CCBER North Campus Open Space baseline biological studies funded by the Associated Students Coastal Fund. Bergy Bits. 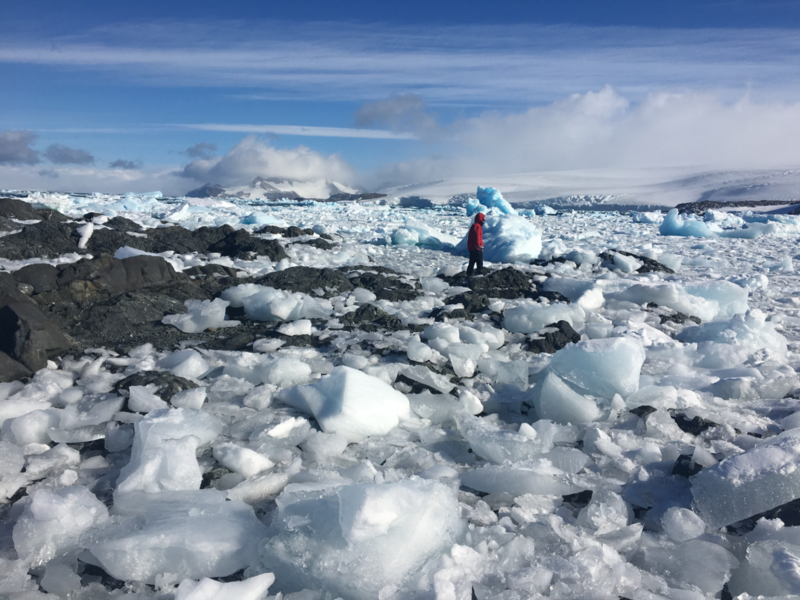 An ERI researcher (UCSB graduate student) surveys the ice conditions along the Joinville Island coast while checking on the status of a tide gauge deployed for the field season. The researchers were reconstructing late Holocene sea levels on Joinville Island from the island’s raised beaches. 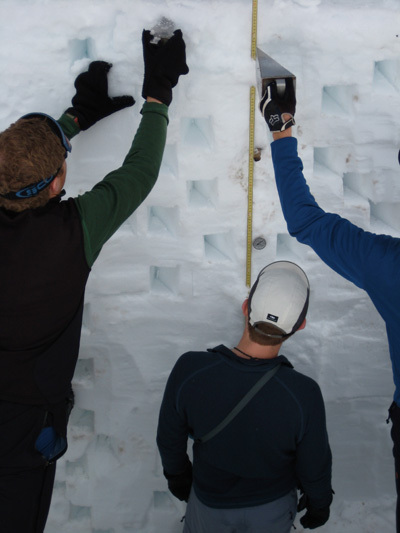 The record of sea level will provide insights into the glacial history and Earth structure beneath the Antarctic Peninsula. Photo credit Alex Simms. 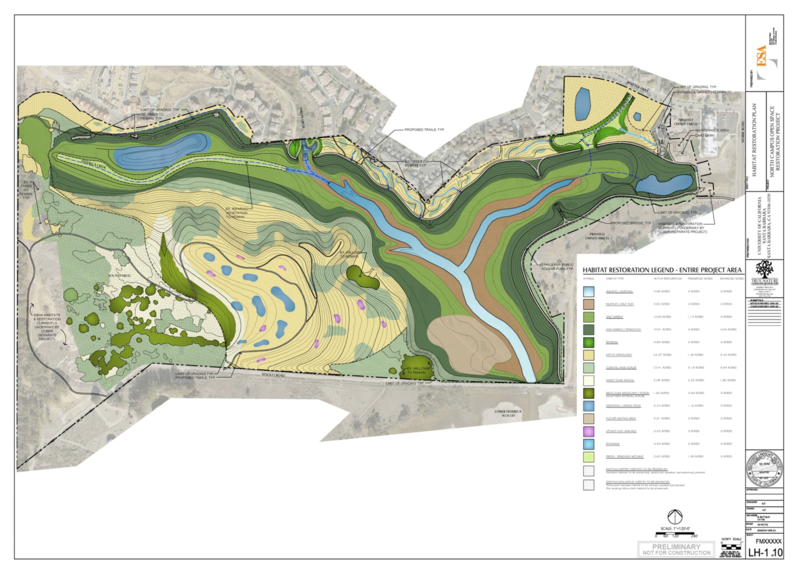 CCBER's North Campus Open Space (NCOS) project - Habitation Restoration Map. 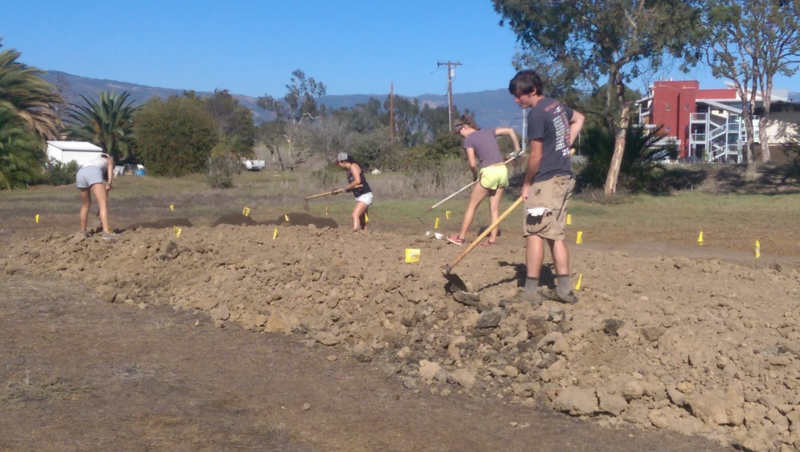 North Parcel Students and staff incorporating soil amendments into soil for the North Campus Open Space Experiment (from left to right: Teal Coppock, Celina Phillips, Cat Reilly and Jerry Hansen). Rock samples from raised beaches on Joinville Island. 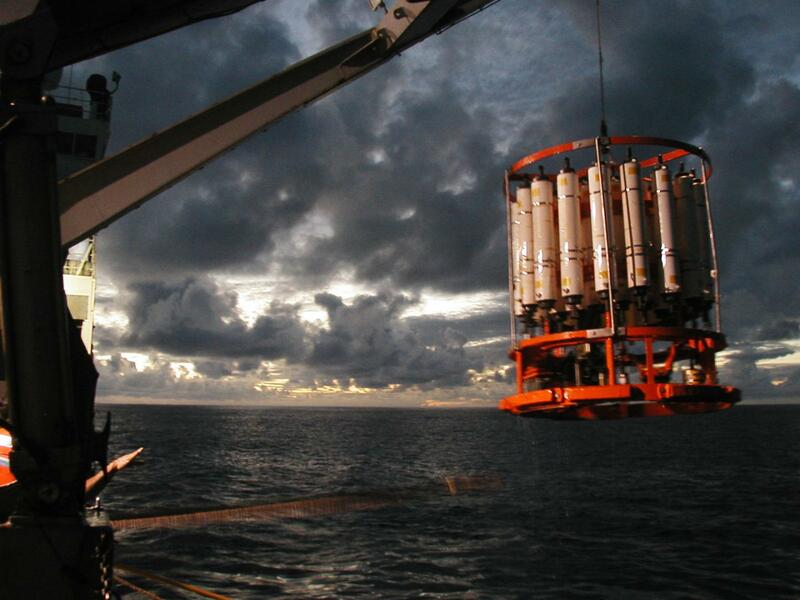 The rock samples will be dated via optically stimulated luminescence (OSL) to determine their age, which when combined with the elevation of the beach ridges will be used to reconstruct late Holocene sea levels for the northern Antarctic Peninsula. 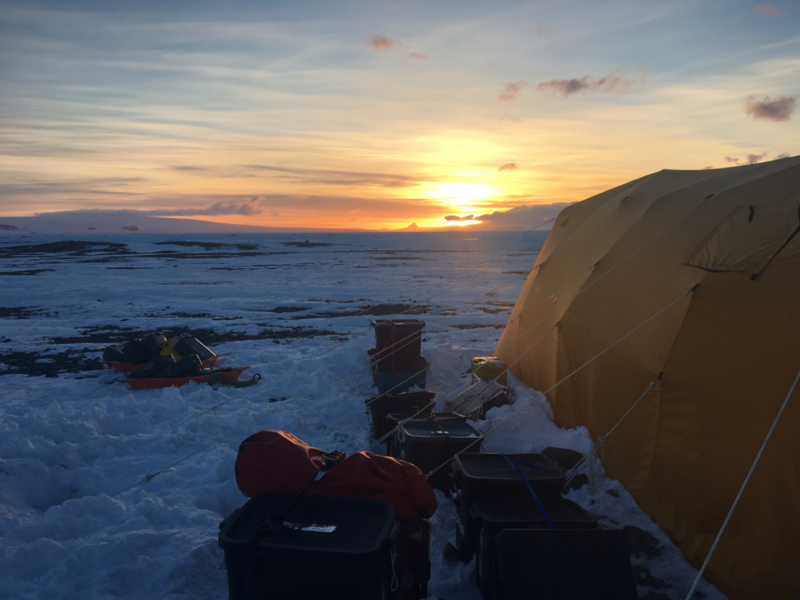 The record of sea level will provide insights into the glacial history and Earth structure beneath the Antarctic Peninsula. Photo credit Alex Simms. Hydrocarbon seeps near UCSB. Image provided by Bruce Luyendyk's research team. Erik Stassinos, Development Engineer (right) and Capt. 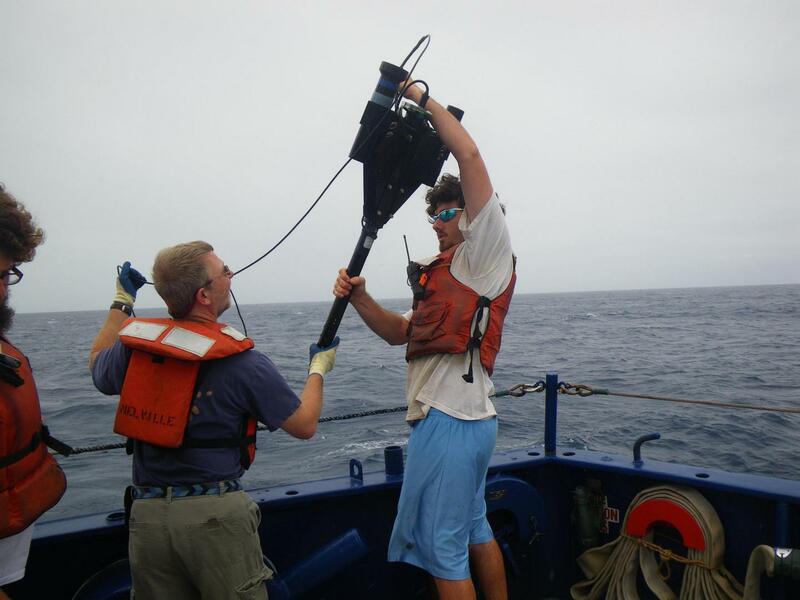 Robert Kamphaus, NOAA (left) deploy the ERI C-OPS spectroradiometer off the NOAA Ship Ronald H. Brown. 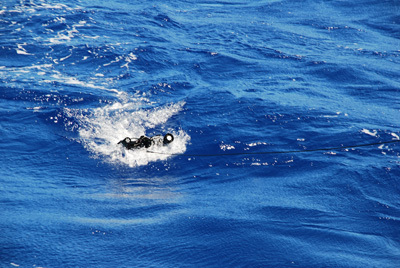 May 2015, North Pacific. Norm Nelson and Dave Siegel, PIs. Photo credit: Samantha Siedlecki, University of Washington. 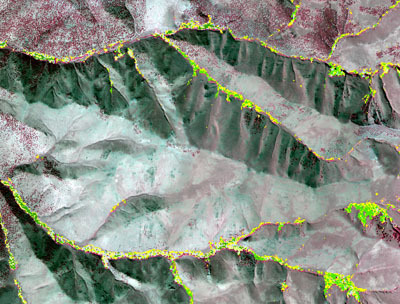 Forest response to global change-type drought is visibly evident at Tejon Ranch in the Tehachapi Mountains of California, near the southern range limit of ponderosa pine (/Pinus ponderosa/). The current three-year drought has coincided with greater than 50% adult mortality in the local ponderosa pine population. 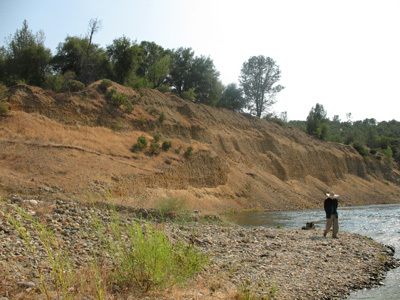 Photo credits: left: Phoebe Prather (Tejon Ranch Conservancy) right: Ian McCullough, UCSB Bren School. 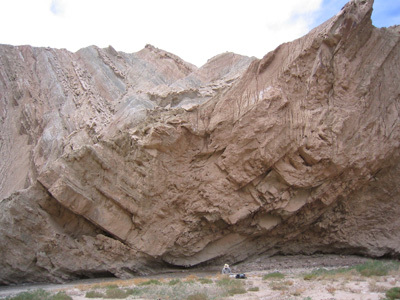 Core of a syncline (concave up fold) in Miocene (24-5 million years) sandstone and shale from the western Tarim Basin, China. Photo provided by Doug Burbank. 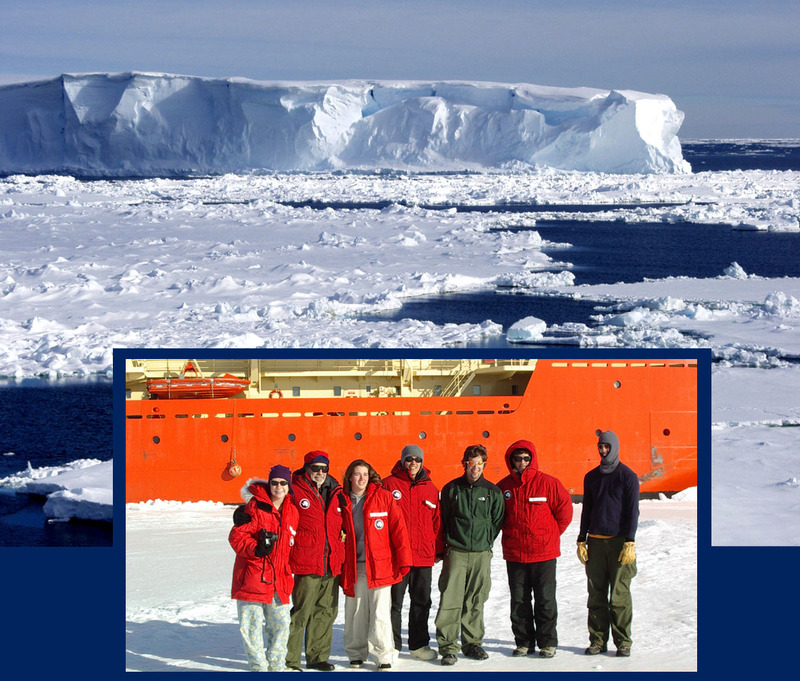 Antarctic Expedition. Photo provided by Bruce Luyendyk. Stuart Halewood Preparing the Plumes and Blooms CTD Seawater sampling package for a cast on the R/V Shearwater. 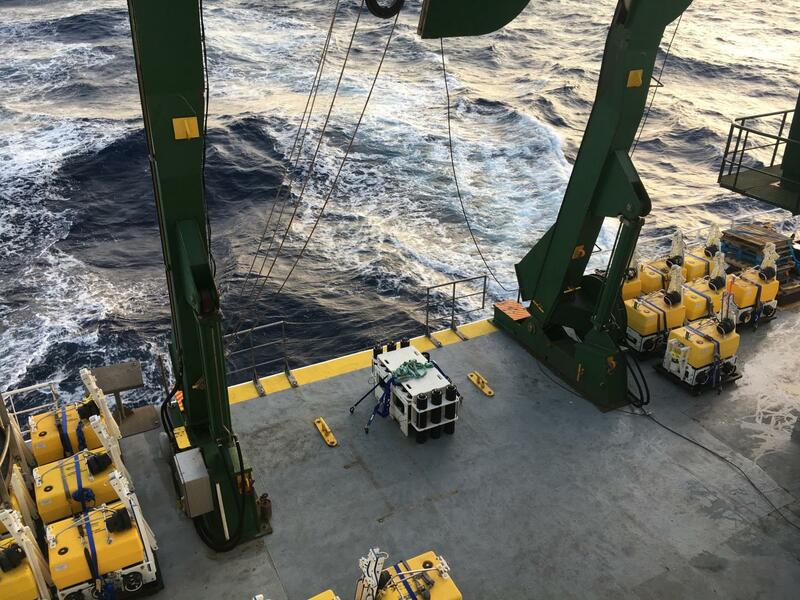 The 7 stations from Santa Rosa Island back to the mainland are Optically and Biologically sampled monthly to depths of 400m and continue to be an important data time series for Coastal Southern california. 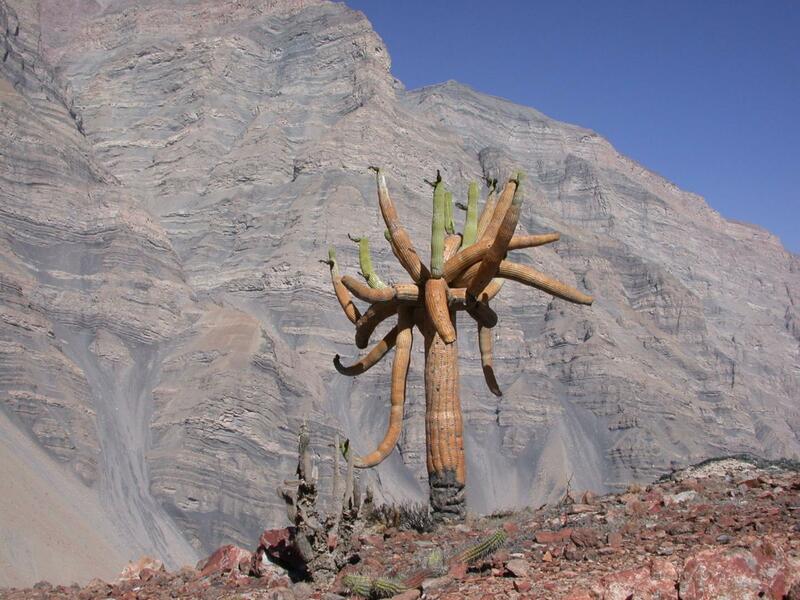 Peruvian Expedition. Photo provided by Doug Burbank. 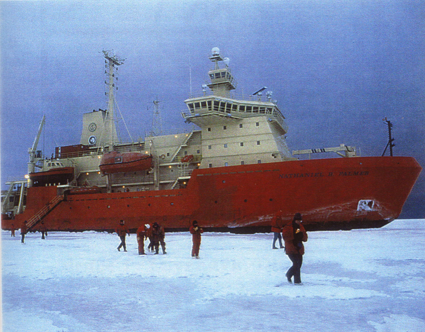 The research ice breaker "Nathaniel B. Palmer" in the sea ice offshore from the McMurdo station, Antarctica. ICS director Bruce Luyendyk and seven undergraduate students conducted a marine geology expedition using this vessel during Winter, 1996. Photo by Carmen Alex. 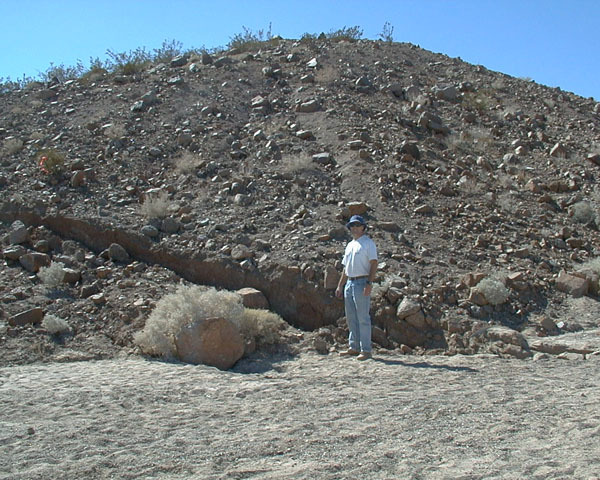 Surface rupture from Oct 16, 1999 M7.1 Hector Mines earthquake near center of Bullion Wash Array. Photo by Aaron Martin. 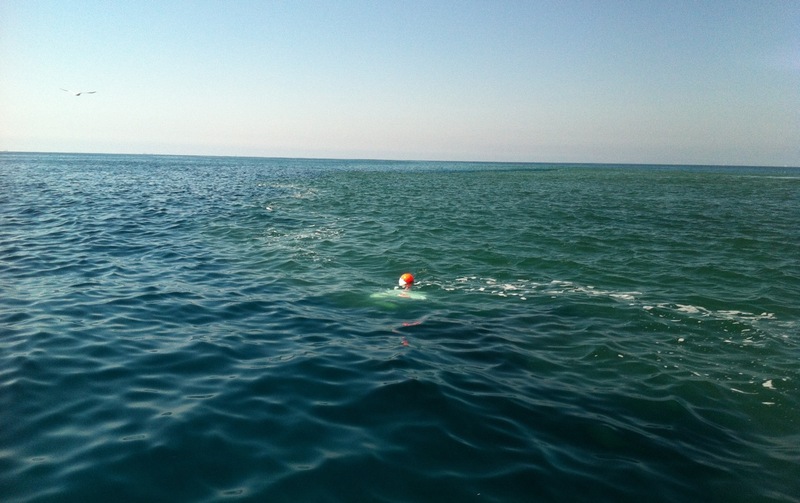 Two ERI researchers (UCSB graduate students) survey the raised beaches of Joinville Island. The beach is home to several fur seals, some of which come there to die. 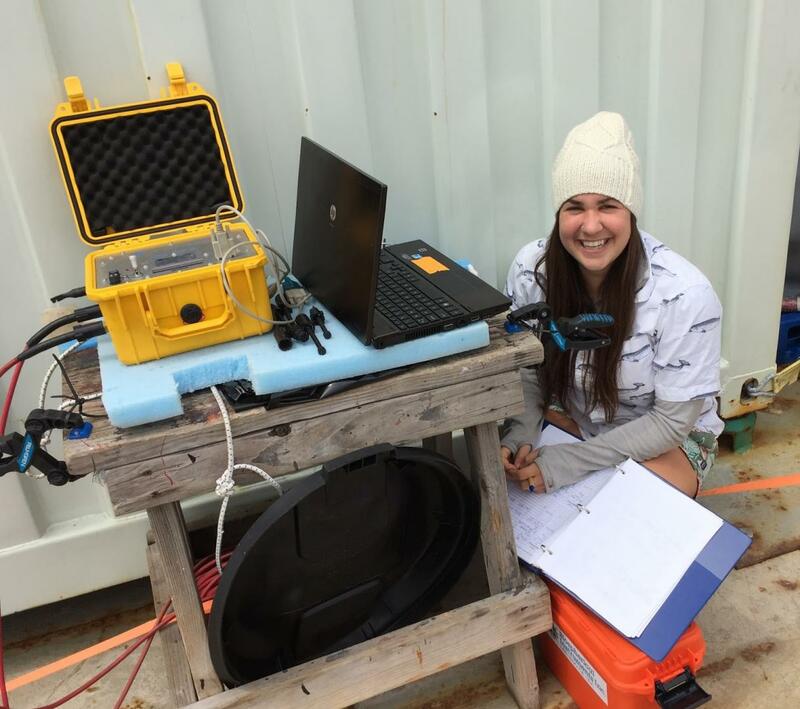 The surveys were taken to determine the age and elevation of the beach ridges in order to reconstruct late Holocene sea levels for the northern Antarctic Peninsula. 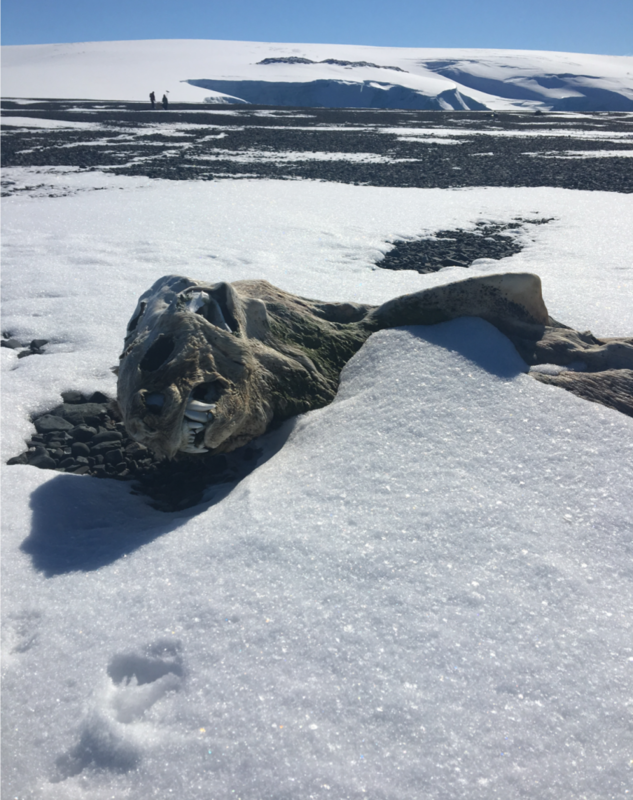 The record of sea level will provide insights into the glacial history and Earth structure beneath the Antarctic Peninsula. Photo credit Alex Simms. 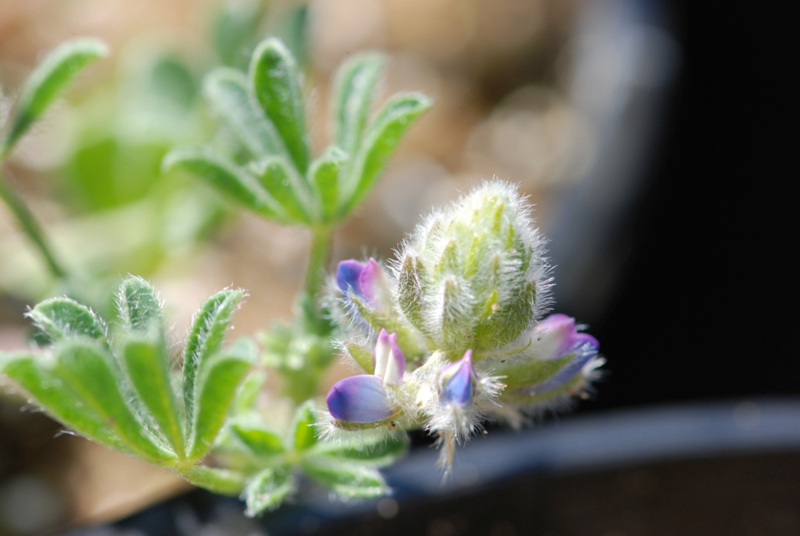 Flower of endangered Nipomo lupine growing in CCBER greenhouse as part of CCBER’s contract to bulk up the seed collection for this endangered species for USFWS. 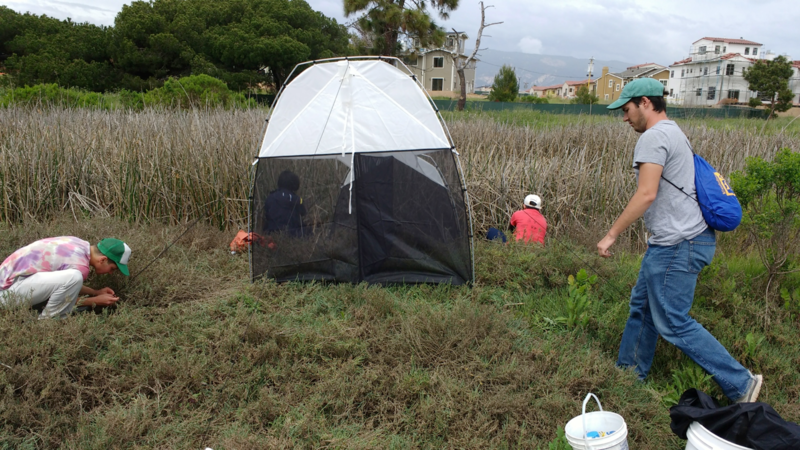 Student interns collecting arthropods using a malaise trap as part of the CCBER NCOS Baseline biological studies funded by the Associated Students Coastal Fund. Graduate Student Kelsey Bisson monitors the status of the C-OPS during a cast. May 2015, North Pacific. Norm Nelson and Dave Siegel, PIs. 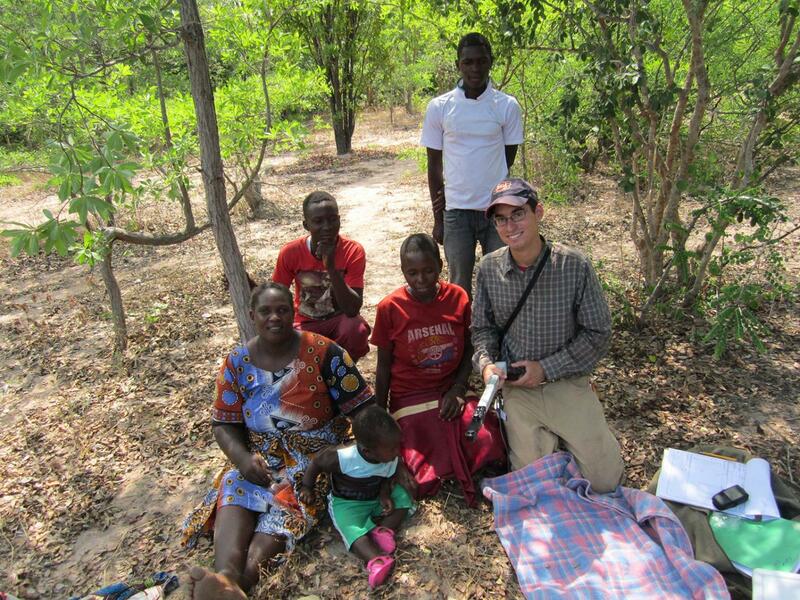 Photo credit: Samantha Siedlecki, University of Washington. A GPS base station deployed on Joinville Island overlooks a series of snow-covered raised beaches and moraines. 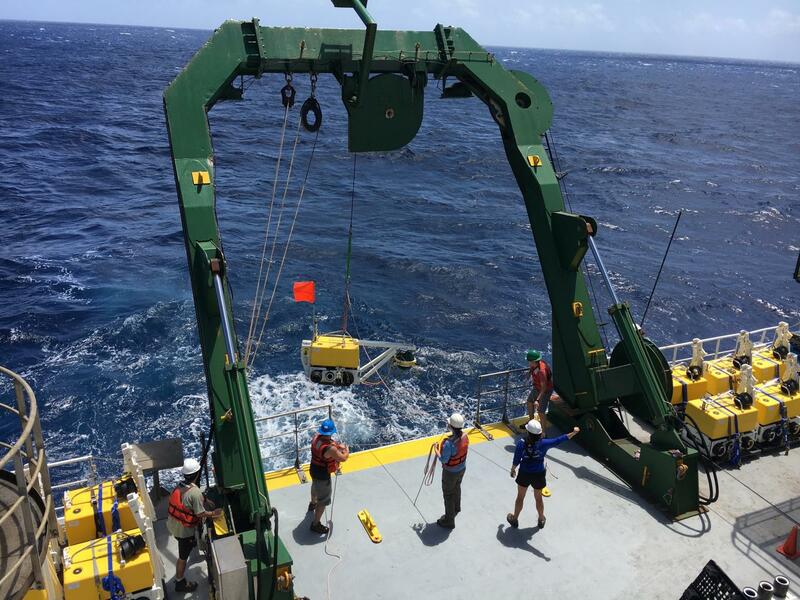 The GPS survey was used to determine the elevation of the beach ridges, which when combined with their ages can be used to reconstruct the late Holocene record of sea-level changes along the northern Antarctic Peninsula. 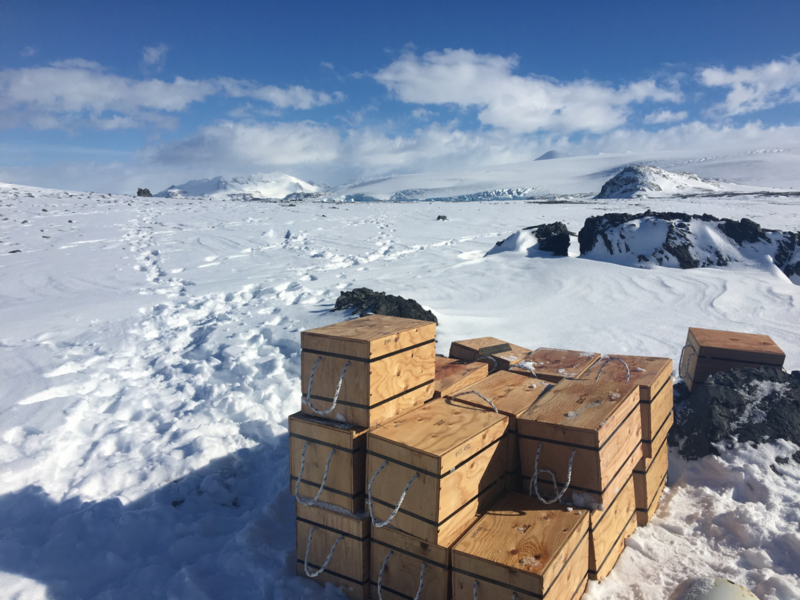 The record of sea level will provide insights into the glacial history and Earth structure beneath the Antarctic Peninsula. Photo credit Alex Simms. 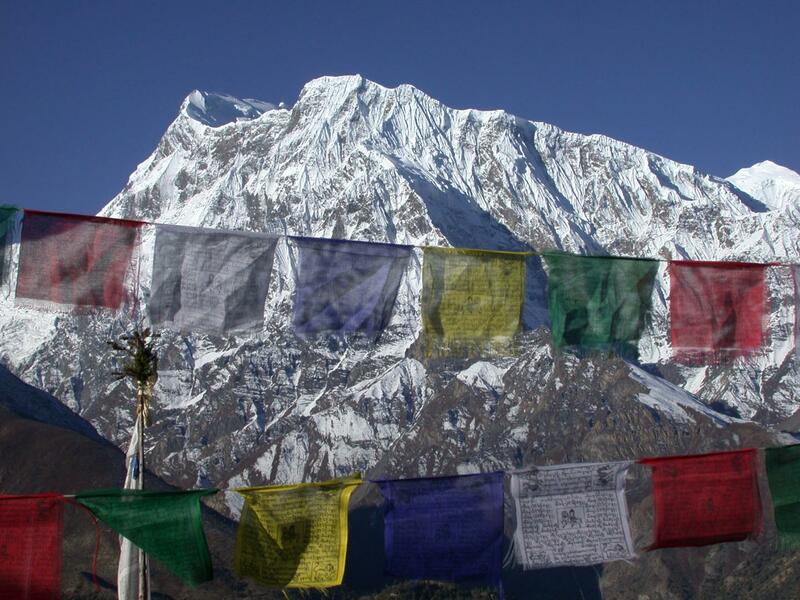 Annapurna Peak (8091m), north-central Nepal, Himalaya. Photo provided by Doug Burbank. Norm Nelson, Researcher (left), and James Allen, Graduate Student (right), pose with the C-OPS prior to deployment. May 2015, Equatorial Pacific. Norm Nelson and Dave Siegel, PIs. 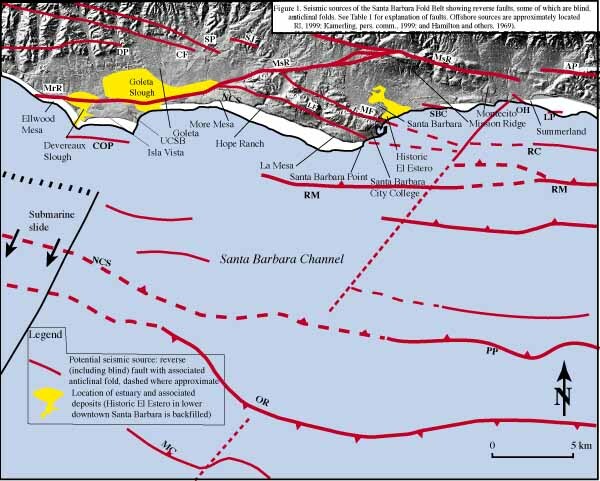 Simulated wave propagation in the Los Angeles area for the hypothetical constant-slip rupture on the Palos Verdes fault. The component of the wavefield shown is oriented along 118 degrees measured from North, and is shown at 20 seconds after the origin time. Hot (cool) colors depict positive (negative) motion along this component, and black depicts quiescence of the waves. 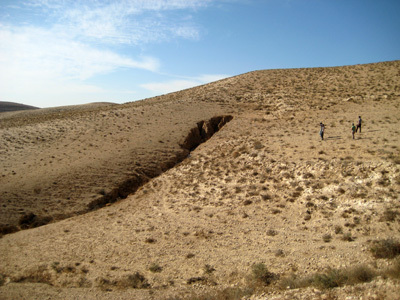 The surface topography, though not included in the simulation, is superimposed in the snapshot. Graphics provide by Kim Olsen. 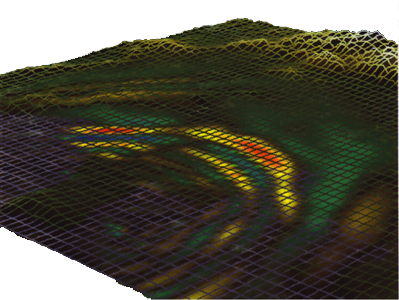 3D tomographic visualization of the LA Basin. 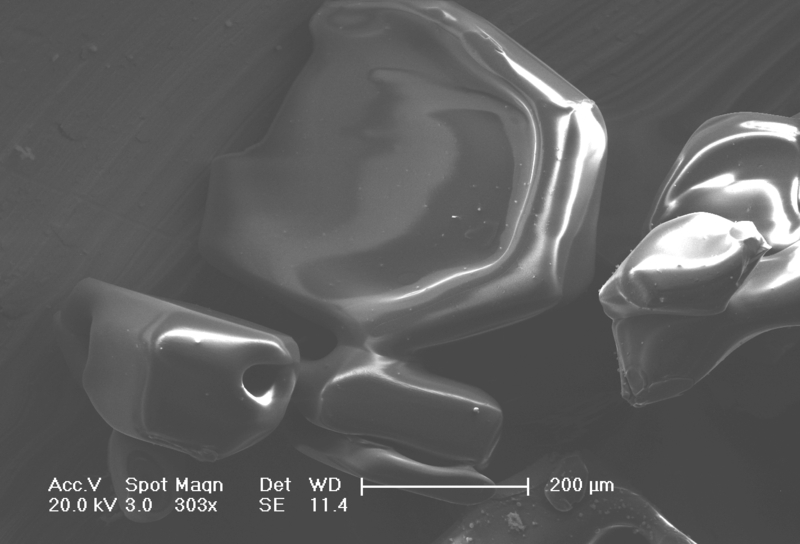 Image provided by Kim Olsen and SCEC. 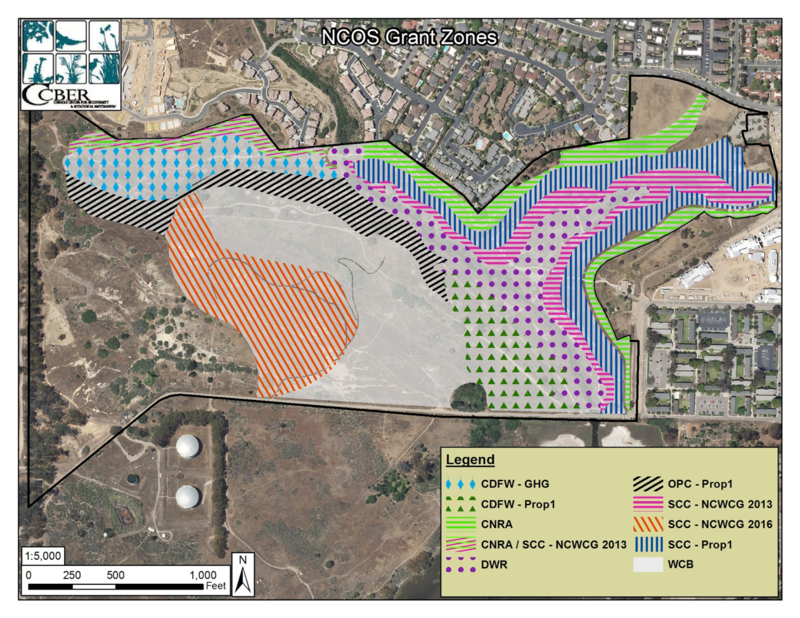 Diagram of funding sources for CCBER's North Campus Open Space project. 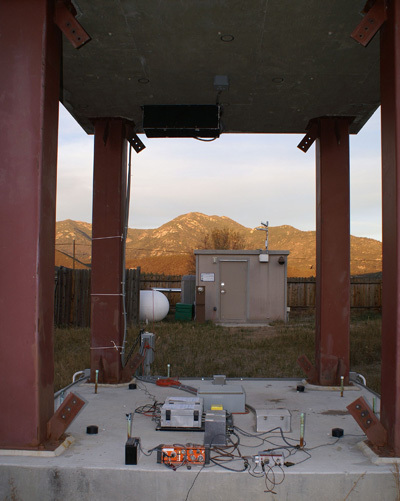 Our areas of research comprise Natural Hazards, Human Impacts, Earth System Science, and Earth Evolution. 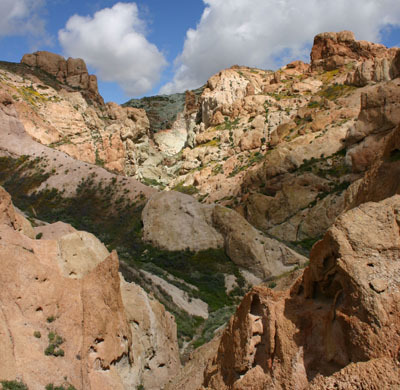 ERI strives to build upon the existing research strengths of our founding units while fostering new interdisiciplinary collaborations examining how Earth processes affect mankind and how mankind perturbs the Earth. 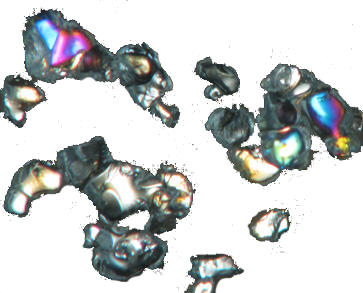 The University of California, Santa Barbara (UCSB) is recruiting a postdoctoral researcher to carry out research on a NSF-funded project: "Using organic carbon isotopes of single microfossils to illuminate Proterozoic eukaryotic ecosystems". 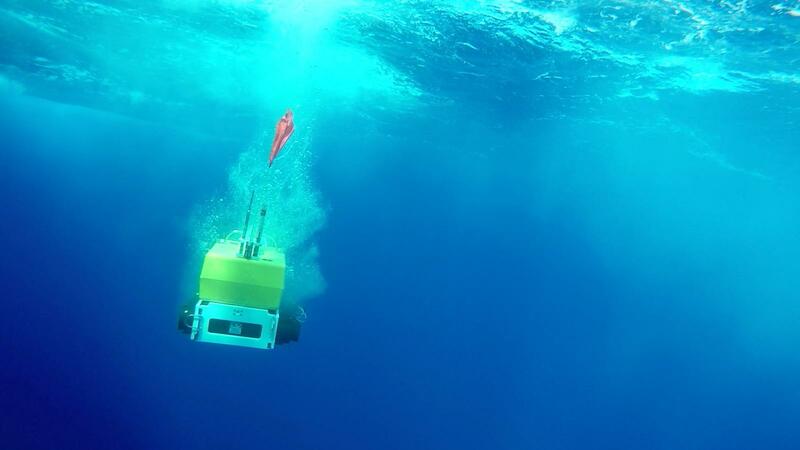 The project will be carried out at UCSB, Syaracuse University and WIlliams College. The fellowship is for 2 years and also includes funds for travel to conferences. For primary consideration apply by April 15, 2019. Position is open until filled and is expected to begin on August 1, 2019. To apply, please upload a cover letter, CV, Research Background and Interest Letter, no more than three publications, and contact information for three references to: https://recruit.ap.ucsb.edu/JPF01469. Email Susannah Porter at porter@geol.ucsb.edu for any questions related to the position. 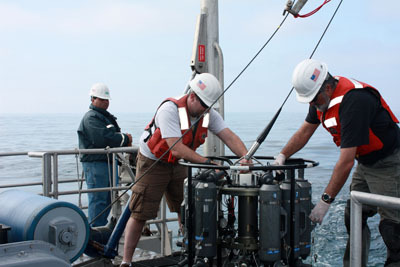 The University of California, Santa Barbara, is seeking a postdoctoral scientist to contribute to a DOE-funded project focusing on understanding the mechanisms for tropical and extratropical Pacific decadal variability in present and future climates. 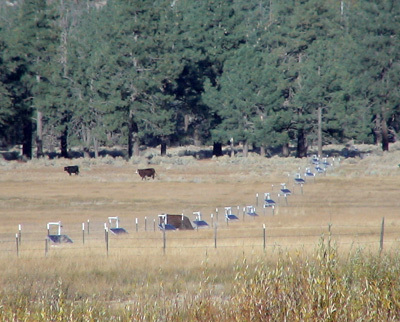 The successful candidate will have the opportunity to define their own original sub-project aligned with the project goals, in collaboration with investigators at UC Santa Barbara, the Georgia Institute of Technology, the NOAA Earth System Research Laboratory, and the Los Alamos National Laboratory. The initial term of the appointment will be 12 months, with the possibility of subsequent extension based on performance and availability of funding. For primary consideration apply by January 15, 2019. Position is open until filled. Preferred start date would be May 2019. To apply, please upload a cover letter, statement of research, including a description of current research interests, experience with climate/Earth system modeling, and near-term research goals. Please also provide a current CV and contact information for 3 references to: https://recruit.ap.ucsb.edu/apply/JPF01424. Email Samantha Stevenson (stevenson@bren.ucsb.edu) with any questions related to the position.